Last week the S&P 500 Index was doing as expected until Friday. Then Whoops, all of Thursday's gains were more than reversed on news of significant economic slowing in Germany along with the Fed's more tepid growth outlook, and the front part of the yield curve inverted. What a difference a day makes. Right after the market review, this week's Digest includes an overdue review of our clever Advanced Ranker analytical tool. S&P 500 Index (SPX) 2800.71 declined 21.77 points or -.77% with 54.17 points of the decline occurring Friday when it looked as if support at the important 2800 level might not hold. The operative upward sloping trendline from the December 26 intraday low crosses right at 2800 and should act as support on any pullback, as mentioned last week. Should it continue lower, the 200-day Moving Average at 2752.96 should provide the next support level. However, failure to hold 2800 will surely disappoint the bulls as it puts the longer term upward sloping trendline from the March 2009 low in jeopardy. See the chart in Digest Issue 1 "Bear Trap Door [Charts]." 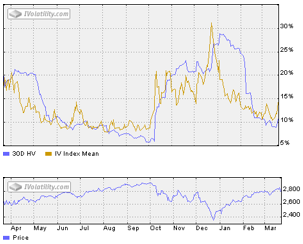 CBOE Volatility Index® (VIX) 16.48 jumped up 3.60 points or +27.95% last week. Our similar IVolatility Implied Volatility Index Mean, IVXM using four at-the-money options for each expiration period along with our proprietary technique that includes the delta and vega of each option, added 3.88 points or +37.42% ending at 14.25. As shown in the volatility chart above, the bullish implied volatility downtrend appears to have ended, at least for now. With 17 trading days until April expiration, the day-weighted premium between April and May allocated 85% to April and 15% to May for a 2.22% premium vs.15.04% for the week ending March 15. Well below the green zone between 10% to 20% associated with S&P 500 Index uptrends puts the operative S&P 500 Index upward sloping trendline in doubt. Since VIX calls are often used for hedging purposes here is an update for the call and put open interest reflecting increased hedging activity with VIX call options. Here is one analytical tool that allows us to claim "In options we are Big Data!" For those who want to find the movers and shakers Advanced Ranker does the job. Every night using closing data, a complimentary sample of four options analysis categories appears on the right side of the Rankers and Scanners section about two-thirds of the way down home page label using the top 200 stocks and ETFs by options volume. Here it was last Friday sorted to show the top and bottom 5 by the IV Index /HV ratio in the last column that identifies those with the highest and lowest 30 day implied volatility relative the historical volatility using the annual rate of change method. While this is the fourth way to rank the data shown with the dark blue circle here are the alternatives. The user's guide has more details about the various way to set up it up. While the results above were based on the top 200 by options volume other categories are available such as All USA, DJIA, SP500, NASDAQ 100, European and Canadian stocks and more. In addition, using our complimentary "My Favorites," users can create their own portfolio or a specialized technology group and run them through the Advanced Ranker. Here is the My Favorites user's guide for more information about this handy auxiliary tool. Since the user's guide explains it in more detail we will focus on the high IV Index / HV ratio shown above. 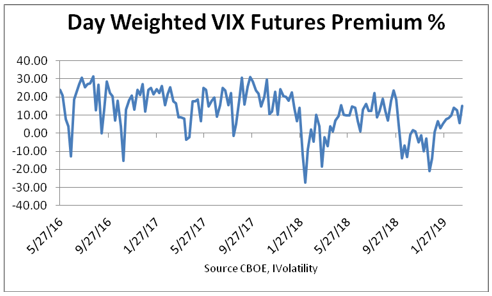 High implied volatility relative to the historical volatility, usually found before events such as earnings reports or FDA announcements, indicates increased options prices in expectation of a large move in the underlying. While the actual move may not be as severe as suggested by the implied volatility, on occasion it may be even greater resulting in what could be a substantial loss for an option position that is short on one side. One way to mitigate this risk is to be short both sides by using an Iron Condor or perhaps an Iron Butterfly. Another alternative is to go with the flow and accept the possibility that the underlying could move even more than suggested by the implied volatility. Calendar spreads, short the near-term option while long the deferred, may also be considered, but with short gamma, or rate of change of delta, a large move in the underlying will results in a loss. Typically ratios exceeding 2.0 suggests increased the risk of a large move in the underlying. In the top category above IBM, BBBY and Ebay are earnings report related and since they will not report for a few weeks the ratios could increase even more. HYG typically moves slowly so Friday's increased options prices reflect hedging activity. Since the next report date for VIAB is more than a month away something else is likely causing increased options prices. For those looking for trade ideas the Advanced Ranker will produce a treasure chest full of ideas using a predefined group or your own portfolio. The S&P 500 Index got whacked Friday by combination of negative macro news from Germany and a yield curve inversion. It struggled to close above the important operative upward sloping trendline at 2800 that also that defines the long-term trend. Any further decline will not please the bulls who were hoping that a retest of the October highs would be just a few weeks away. In the meanwhile there were more signs of increased hedging activity as could be expected. Next week will include a more comprehensive market review.